The largest political event in the health & fitness sector’s annual calendar is to be held at London's Congress Centre for the third year in a row. The ukactive National Summit will examine the future of physical activity and the public health agenda. The ukactive National Summit is expected to attract more than 400 senior influencers from across physical activity, health, policy, brand, media, research, the charity space, and local authority commissioning. It will be chaired by The Guardian & Observer’s Health Correspondent, Denis Campbell. Among the many high profile speakers attending the event are former Olympic gold medallist James Cracknell OBE, Rt Hon Andy Burnham MP, Shadow Secretary of State for Health, Professor Kevin Fenton, Director of Health and Wellbeing, Public Health England, Parliamentarian and former Paralympian Baroness Grey-Thompson DBE, former Director of Strategy at number 10 Lord Andrew Cooper, and Parliamentary Under Secretary of State for Public Health, Jane Ellison MP. The Congress Centre provides purpose-designed, flexible event space suitable for anything from a small business lunch to a large 3-day conference. 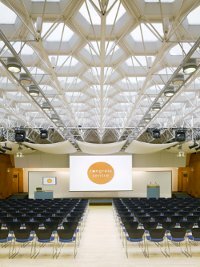 The venue is set within an architecturally-renowned 1950s’ modernist building which provides a striking backdrop for a wide variety of meetings and events. Their central location, excellent customer service and wide range of facilities make them a popular choice for conferences, exhibitions, meetings and events.